In the recent times, almost every food consumer in the world has developed a very high concern over the quality and the safety standard of the food after a torrent of food scandals. Umpteen amounts of short coming over the food supply chain has raised a substantial amount of questions over consumer’s food and health related safety. In order to improve the food quality and safety with consumer health in mind, effective measures and processes were implemented with the main aim of eliminating the risks associated with food safety. Such measures lead the entire food supply chain businesses to demonstrate their ability to be in compliance with the legal requirements concerning the area of food safety and hygiene. The process and practice of food inspection has its history starting from the purity testing of brewed drinks way back in the ancient era. However, it was only during the early 19th century in the USA where, the concern over the food safety rose to a serious level where a distinct law has been put in place in regards to the control and compliance over the food safety. 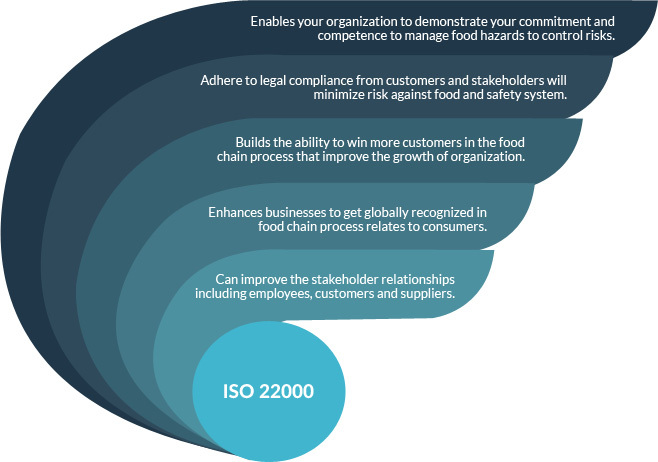 WHAT IS ISO 22000 Food Safety Standard? ISO 22000 is an internationally recognised standard for Food Safety Management System that incorporates the widely proven HACCP and Good Manufacturing Principles which applies to any organization in the food chain, farm to fork. ISO 22000:2005 is a standard dealing with food safety which specifies the necessity of food safety management system for the organizations representing a food chain such that they could validate its ability to control food safety hazards in order to ensure that food is safe at the time of human consumption.It applies to the processes that create and control the products and services an organisation supplies where it prescribes systematic control of activities to ensure that the needs and expectations of customers are met. ISO 22000 standards are align with generic system of ISO 9001 and ISO 14001 to enable effective system integrationto maintain harmonization of managing food safety system for all organizations in the food chain and for those organizations supplying to the food chain, materials and services that could impact on the safety of food. ISO 22000 / FSSC 22000 standard helps in avoiding physical, chemical and biological hazards being retained in finish goods. The ISO 22000 standard requirements are helpful in implementation of an effective food safety management system through a framework for the continual improvement, development and implementation of a FSMS, where controls are being established at raw materials, manufacturing processes, storage processing, packing processes, logistics processes etc. to avoid food hazards. This heavily coveted standard was created by organisations to ensure that there is absolute safety in all the industries who are involved in the production and distribution of food. The ISO 22000 helps the organizations build a strong customer focus and ensures consistent top management commitment through an effective process approach wherein all processes in the system are managed for building efficiencies and effectiveness. WHO SHOULD BE ISO 22000 CERTIFIED? ISO 22000 offers a framework to the organization where continual improvement process is established for evaluating and assessing customer requirements that relates to food safety and demonstrating conformity to these requirement. Food Safety means adequate controls on presence of food based hazards in food at the time of its consumptions as the food supply chain is not a single stage process. It is a combined effort of all the party participating in the food chain, this includes Feed Producers, Primary Producers through manufacturer, Transporter, Store operator, wholesalers, retailers, Caterers, Food Service Outlets and Producers of Equipment’s, Packaging Materials, Cleaning Agents, Additives & preservatives & Ingredients and Service providers. An effective and FSMS helps the organization to prevent problems like the presence of Microbes, Toxins and Adulteration etc before its occurrence & Suggest Corrective action. Registration to ISO 22000 by an accredited certification body shows committed to quality, customers, and a willingness to work towards improving efficiency where the organisation demonstrates the existence of an effective quality management system that satisfies the rigours of an independent external audit. However, organizations need to keep on improving internally so that they are able to achieve customer satisfaction. To plan, implement, operate, maintain and update a food safety management system aimed at providing products that, according to their intended use, are safe for the consumer. To demonstrate compliance with applicable statutory and regulatory food safety requirements. To evaluate and assess customer requirements and demonstrate conformity with those mutually agreed customer requirements that relate to food safety, in order toenhance customer satisfaction. To effectively communicate food safety issues to their suppliers, customers and relevant interested parties in the food chain. To ensure that the organisation conforms to its stated food safety policy. To demonstrate such conformity to relevant interested parties. To seek certification or registration of its food safety management system by an external organisation, or make a self-assessment or self-declaration of conformity to this International Standard. Safe food is a worldwide issue. It becomes very important when there is a peer pressure from consumers, retailers, social groups, and legislative bodies affecting the whole food supply chain. The Answers is TRAIBCERT CERTIFICATION for ISO 22000:2005. In brief, ISO 22000 prescribes the criteria for a food safety management system that an organization may want to build. 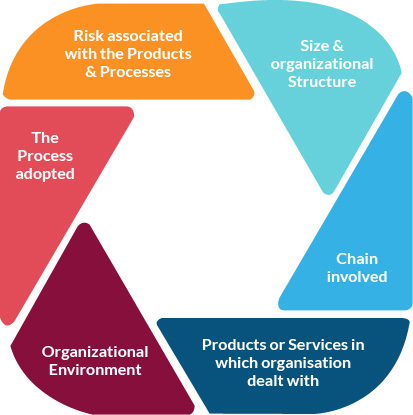 Any type of an organization within a food chain can refer to these criteria and develop its own food safety management system. 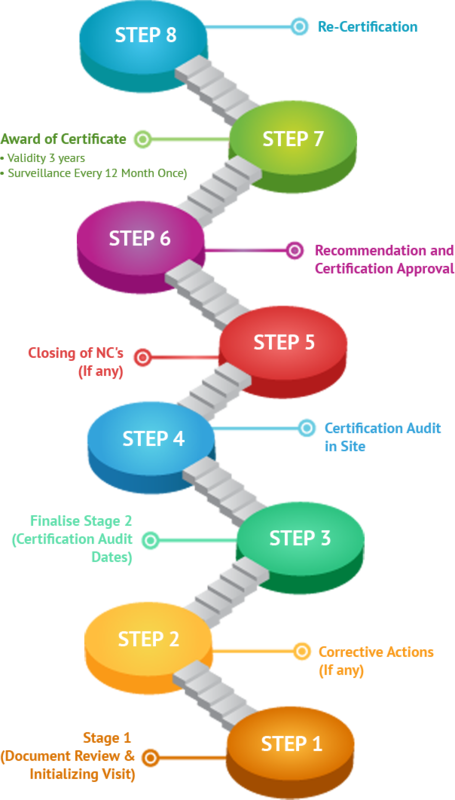 Once all applicable criteria are addressed, the organization can get this food safety management system certified from Traibcert limited.Food safety management systems that conform to ISO 22000 are certifiable as it is a viable solution to the increasing demands for supplier certification in the food sector. The standard is flexible enough to be implemented only for the benefits it bestows without certification of conformity. Fulfillment of all statutory and regulatory requirements specified for products/services being offered. Sophisticated infrastructure and work environment to control food hazards. 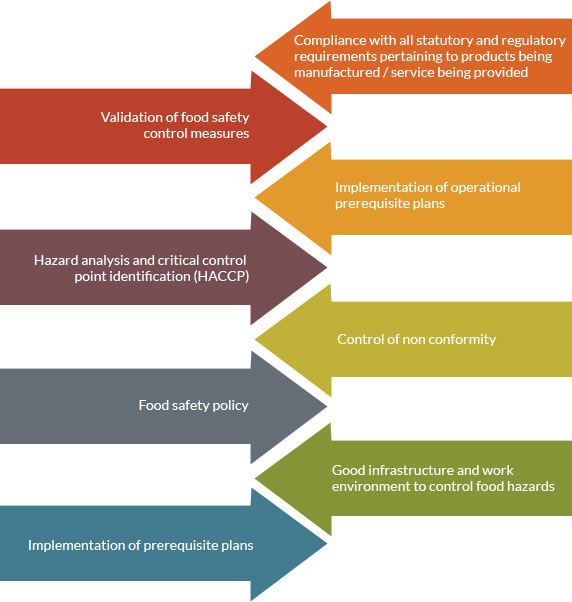 Validation of food safety control measures. Implementation of operational prerequisite plans. 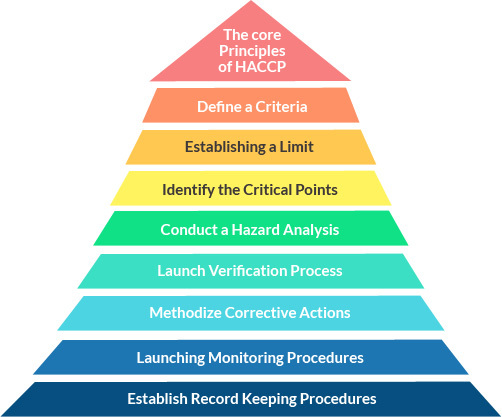 Hazard analysis and critical control point identification (HACCP). Once all the requirements of ISO 22000 have been met, it is time for an external audit to be carried out by an independent third party accredited certification body like TRAIBCERT who will review the quality manuals and procedures over the certification roadmap. Once our highly competent & qualified auditors who are experts in the sector, identifies that yousatisfy the requirements of ISO 22000-2005, we TRAIBCERT a leading accredited certification body will Issue the ISO 22000-2005 certificate. Increases operational efficiencies and reduces operating costs. Continual improvement of processes and improved risk management. Greater traceability and consistency of product. Improved stakeholder, suppliers, employee relationship and customer satisfaction. Achieve regulatory and statutory requirements of legal compliance through management reviews and internal audits. Proven business credentials and procures more businesses. Accomplish safety, quality and legality. We at TRAIBCERT,an independent third party certification body, will bring into our years of experience and device comprehensive strategies to impart your organisation with the complete skill set, and also for bringing it up to speed so as to comply with all the HACCP Principles and the Food Safety Management System standards.We help organizations in achieving ISO 22000 food safety management system certification with complete guidance to Gap analysis/Pre audit, template designing, training, document assessment. 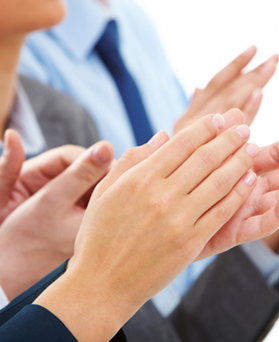 At TRAIBCERT, we follow a friendly approach and a dislike of bureaucracy. Our highly experienced and domain oriented auditors that have empathy with this approach as they are also carefully allocated by their experience in the industry they are auditing. 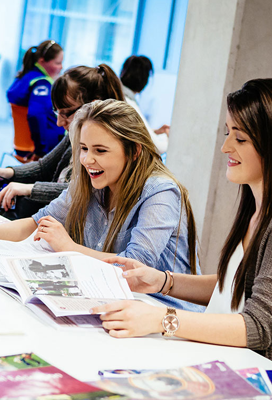 This results in a practical, meaningful audit, carried out in an air of mutual understanding. We also, believe that audits should benefit the organisation that requests it, not be an intellectual exercise to 'please' the auditor. An ISO 22000 certified organization is considered to be more reliable than the other similar organizations that are not certified. The certification is globally accepted and is gained by large as well as small organizations hence bring an equality in terms its positioning of brand reliability per say. The certification adds up to the brand recognition. 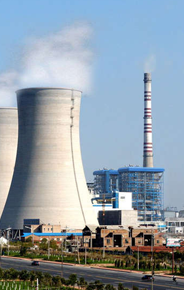 Interested parties of an organization include its customers, owners, employees, suppliers, bankers, etc. The organization’s performance becomes more and more reliable improving trust level and confidence of all these interested parties get a boost. The ISO 22000 requires the organization to establish certain pre-requisite program that in most cases meet the statutory and regulatory requirements pertaining to food hygiene. The organization witnesses an improved compliance to such requirements. By consistently delivering safe to consume food, an ISO 20000 certified organization contributes to the betterment of the society in terms of reduction in food borne diseases. 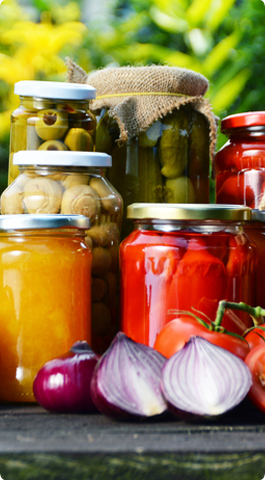 By adopting the various measures through an application of the food safety management system, the product shelf life improves due to the reduction in the contamination. At TRAIBCERT, we offer a wide range of ISO 22000 training and certification designed to help you accomplish one of the globally recognized food safety management systems. TRAIB CERT FSMS Certification gives your organization a global competitive edge and establishes a quality framework in your place which enables you to meet business targets with improved efficiency and cutting costs.